Paul Jaeger, the oldest son of Franz Jaeger, was born in New York City. He was only two years old when his parents returned to Germany and settled in Suhl, where he grew up, went to school, graduated from high school and learned a trade as actioner. He then studied and graduated from engineering school. His first job was the management of the newly formed Magnus-Jaeger Company in the old brewery in Maebendorf near Suhl. When this venture failed due to new export restrictions, he emigrated to the United State of America in 1927, just two years before the advent of the Great Depression. Since he was an American citizen by birth, nothing stood in his way to do this. After a short stay in New York City, he moved to Philadelphia where he most likely worked for the Sedgley Company and later went in business for himself as a gunsmith. He attracted a good clientele and bought a house in Germantown, a district in Philadelphia. He rented a shop in Jenkintown, Pennsylvania, a suburb of Philadelphia. He soon convinced his girlfriend Annelise in Germany to marry him and follow him to America. Annelise became the friend of a well-to-do lady who gave them what formerly was a horse stable in Jenkintown which Paul converted to shops. His business was good enough to allow him to build a better home in Oreland near Jenkintown. During World War II he converted his shop to a machine shop and acquired many machines for war production. 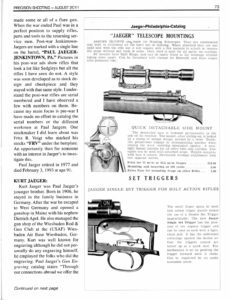 As soon as the war ended, Paul Jaeger converted the lower floor of his building into a retail store where he sold guns, gun accessories and sporting goods. In the shop he switched to the production of hunting rifles from surplus military components. 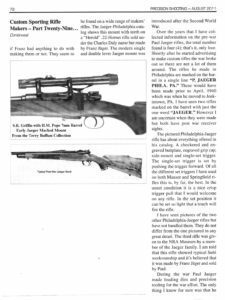 For these rifles he designed and manufactured adjustable triggers, safeties, open sights, detachable sling swivels and scope mounts. At the peak of his carrier, Jaeger became very well known to gun owners as an importer, manufacturer, gun shop, wholesaler and retail outlet. Paul Jaeger retained control of his company until he was almost 80 years old. Market conditions had changed but the company had not kept up with the changes. A controlling interest was sold to a mail order company in 1985, but this company went out of business. The Jaeger name was brought back into the family. 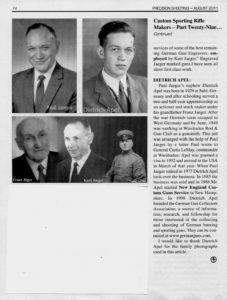 Paul Jaeger was a great help to his parents and his brothers during difficult times and he tried hard to send his father as many orders as he could. Many “Care Packages” were a great help for the family in Germany after the end of World War II. American gun owners will remember him for his reasonably priced bolt action rifles which he could supply when the bigger factories had not yet converted to peacetime production. When the company closed its doors in Jenkintown, all gun records had to be turned over to the Government. 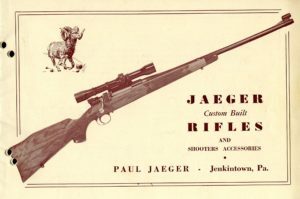 Only the rifles that have the inscription “Paul Jaeger, Jenkintown Pa.” on the barrel are considered genuine Jaeger rifles. The month and year of production can usually be found under the buttplate or recoil pad with the letter FRV, the initials of the stock maker Fritz Voigt, and the month and year when the rifle was made. 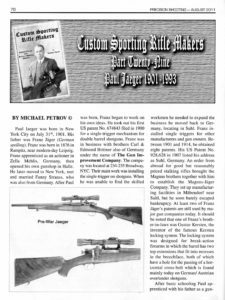 Below you will find an article about Paul Jaeger and the other Jaeger Gun Makers, thanks to the permission from Michael Petrov, the author, and Precision Shooting Magazine, the publisher.We have much more information about Paul Jaeger and will publish it together with reprints of Jaeger catalogs as an Almanac in the near future. 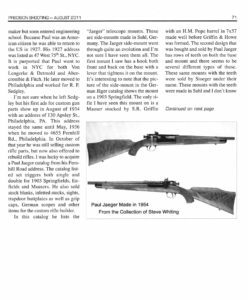 Click Here to view a Paul Jaeger catalog.